Small die grinders (or small rotary tools) are fun to use. Well built ones are like pens that write in wood. 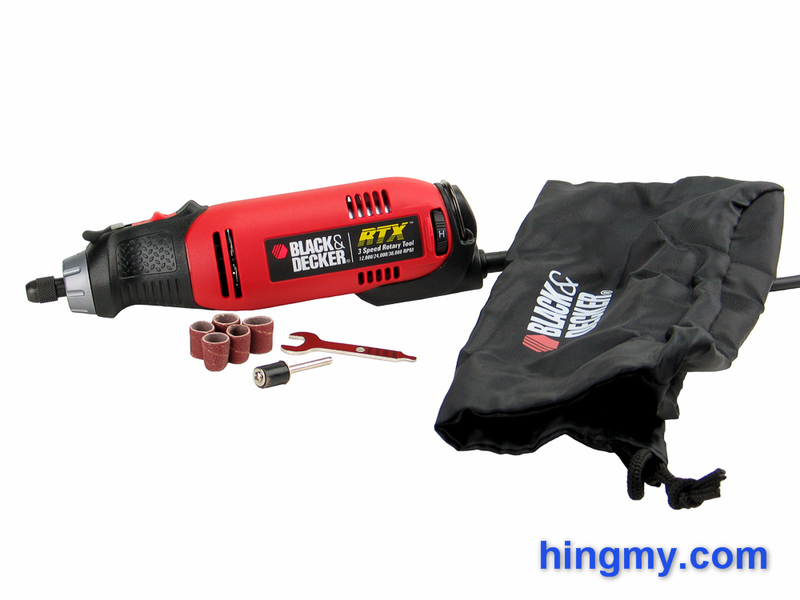 The Black&Decker RTX rotary tool is a challenger in a niche dominated by the Dremel company. Always wanting to support healthy competition we had to get the RTX into our shop. Let's take a look, if the cheaper challenger can take it to the king of rotary tools. The RTX immediately manages to impress with its compact feel. You get an amazingly well built tool for the price. 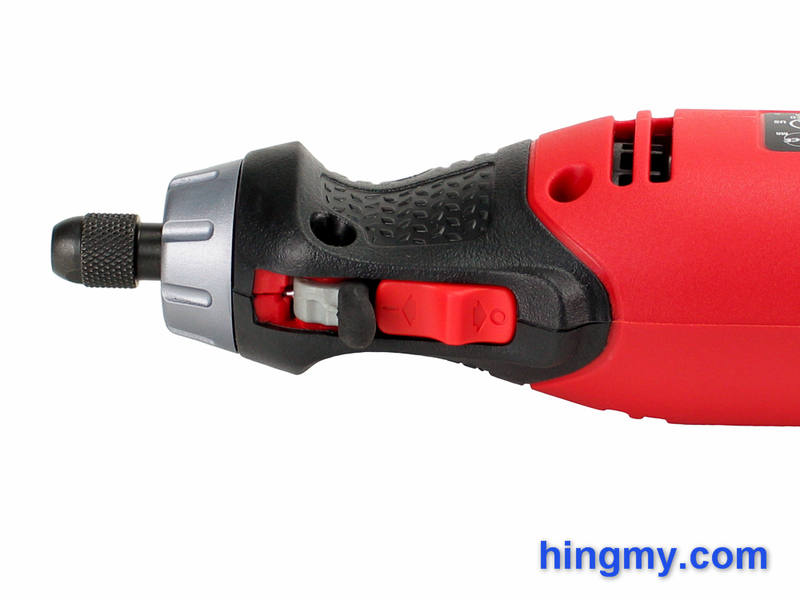 The reddish plastic body flows into a rubber grip at the tip of the tool. The RTX wants to be held like a pen, which is the preferred position for fine work, or from above like a knife, which offers control while doing rough work. In both cases balance is excellent. Black&Decker found a good compromise between weight and power. The RTX is equipped with a variable speed motor. A speed selection wheel near the rear of the tool varies the bit speed between 10,000 and 30,000rpm. The tool maintains the selected speed throughout the cut. Only very heavy cuts slow the grinder down in a meaningful way. At 2 amps the motor is in the middle of the power band for small die grinders. The available power is enough for detailed work, but fades quickly when doing rough carving work. The motor comes to life when the user pushes the red on/off switch forward. The switch is not always within reach of the hand that holds the tool. The operator must be careful not to get his other hand near the bit when turning the tool off. Mounting the switch further away from the bit would have been a safer option, but the current design poses no threat to an alert user. Small die grinders in this class are made to be disposable. To keep the weight and price down manufacturers use lower quality materials. The Black&Decker RTX is no exception. It is well built to hobbyist level, but would not see the end of the workday when used for heavy construction. All of that is ok when you consider what the tool is made for. The RTX will happily complete several hours of carving on the weekend or make a few cuts on the job site on a regular basis. You only get in trouble when you try to use this die grinder as an industrial tool. At 7.6 feet, the power cord of the RTX is not overly long, but it is longer than the cord of any Dremel. The boot that covers the joint where the cord meets the body of the tool does a good job of keeping the cord out of the way during a cut. The bit change procedure is among the most convenient in the business. A lever at the front of the tool locks the spindle in place. This leaves both hands free to loosen the collet with a wrench. Users with little arm strength need not worry. Very little force is required to securely tighten the collet. The whole process is flawless short of one issue. The wrench included in the kit is functional, but barely so. It is not very large and made from stamped metal. Sometimes it can be hard to keep the wrench on the collet while tightening it. The first thing any new RTX owner should do is is purchase a proper wrench of the correct size for use with this tool. A full-size wrench makes bit changes a breeze. The RTX uses a 1/8" collet making it compatible with the entire line of Dremel accessories. The grey ring at the front of the tool hides mounting threads which can be used to mount guide plates. This mount is compatible with the Dremel line as well. The guide plates in particular, extend the capabilities of the RTX. The router plate, for example, turns the RTX into a small router. The quality of Black&Decker accessories, and any other manufacturer for that matter, varies very wildly. It's usually best to experiment with several different bits until you find a tool that works best for your work. Thanks to the interoperability between bits from different manufacturers it matters very little which tool or bit you choose. Either one can be replaced with a different brand. The bag included in the kit is only slightly better than a zip-lock bag. Made from plastic the single compartment bag does little to organize the accessories that come with the tool. You'll probably never use the bag. Thankfully it probably added very little to the price of the tool. When you pick up the RTX, the first thing you want to do is engrave something. Equipped with a small engraving bit the RTX is in its element. The motor's speed and power, the tool's weight, and the excellent ergonomics combine to offer an nearly flawless experience. Making fine cuts that require the utmost precision are no problem with the RTX. As the bits get larger and the work tougher the performance of the RTX drops. When using a sanding drum or carving attachment the motor produces reasonable results. The mediocre power output and motor speed, however, limit what the RTX can do. The work goes slower than it does with faster, more powerful rotary tools. The RTX will see the finish line, but it won't challenge for top spot. To test the endurance of the motor, we put the tool through a 2 hour carving test. The motor did not show any signs of premature wear at an 80% duty cycle. The rear of the tool did get hot, but not overly so. Off course we do not expect this trend to continue indefinitely. We merely hope to illustrate that the RTX is not a toy. It can be used for project work of a certain scale. At the same it is not a replacement for a two-piece grinder. Like all rotary tools the RTX offers no dust collection. It depends on the air stream generated by the bit to clear the dust near the bit, which can be non-existent depending on the bit. The motor's cooling fan ejects air through the side of the tool, which neither hinders or helps with the situation. If you care about keeping your work area clean, an external dust collection system is necessary. The RTX undoubtedly was made compete with Dremel's lineup of rotary tools. The motor's power and speed position the RTX in the upper middle region of the field. The price is in bargain territory. Compared to the smaller Dremels the RTX is an amazing value. It is significantly better built than these budget tools, offers more power, and costs less. 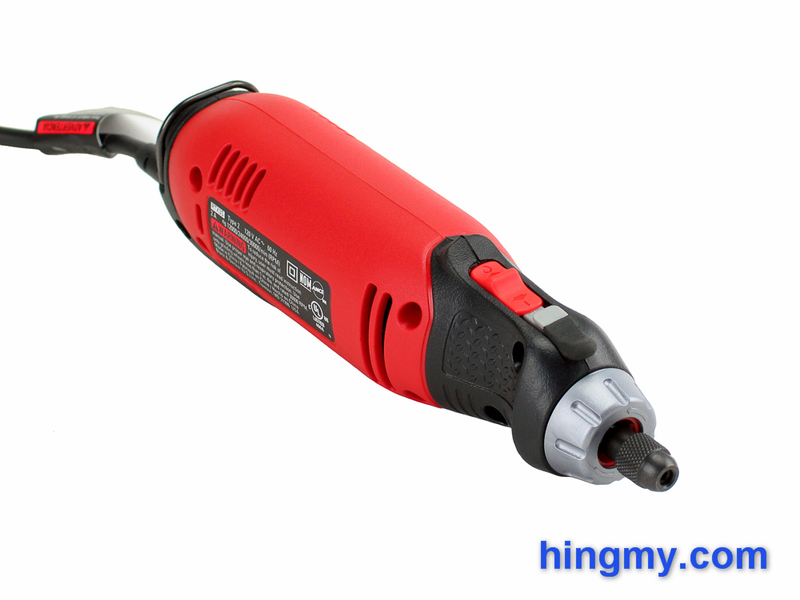 In this comparison it is the better rotary tool. The comparison between the RTX and the higher priced Dremels is a more complicated one. In this comparison the Dremels outperform the RTX, but RTX maintains a slight lead in build quality. If you absolutely need the extra power the Dremels offer, they are a better choice. For fine work the combo of quality, performance, price, and weight that is the RTX is hard to beat. 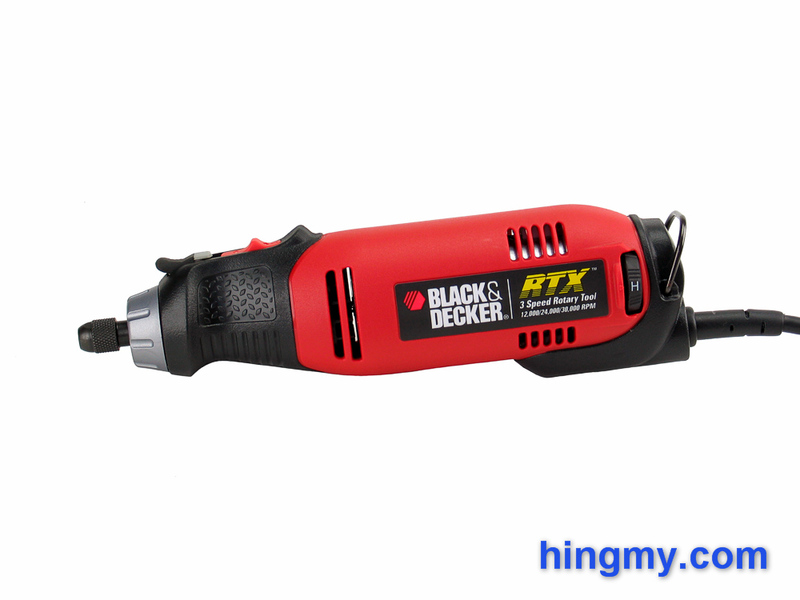 The Black&Decker RTX is one of the best small rotary tools on the market today. It strikes a great balance between power and weight. Detailed work in particular flows very easily with the RTX. It can be held like a pen without the fear of losing control. The bit change procedure is one of the best in the market today. Performance drops as work gets larger. This is not the right tool for heavy woodcarving. Thanks to the need to compete with Dremel, Black&Decker has priced the RTX very aggressively. The RTX can even mount Dremel accessories. In many respects the RTX is a better Dremel. This should be your goto rotary tool.